AKRON, OH (WOIO) - Akron Public Schools is working to eliminate obstacles for students as they prepare for internships, career shadows, jobs and special school events. According to the U.S. Census Bureau, close to 40 percent of Akron’s children live in poverty. 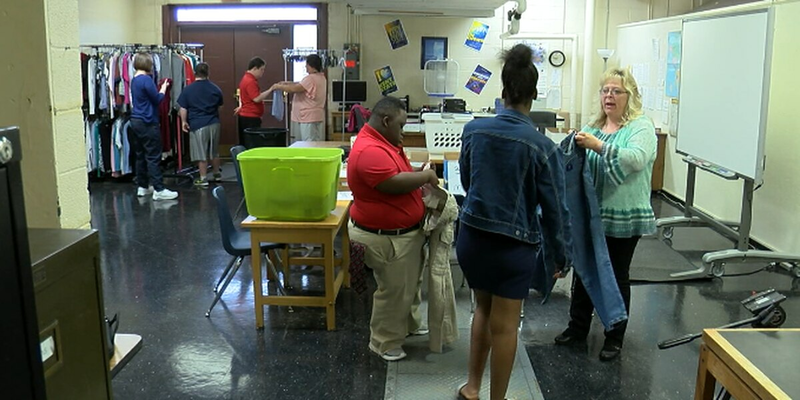 The North Viking Career Closet inside North High School is making sure kids make a good first impression no matter their ability to buy or get their hands on professional clothing. "There's a big need," said Dianne Falasco, an intervention specialist with the district. "Parents are paying bills, they're putting food on the table and they don't always have the means to get professional clothing say in two days when we have an event. Or, many of our students come from different countries and have different cultures. They don't always have what they need to be able to attend these events. So we really meet that need." The clothing includes shoes, ties, dress shirts, dresses, skirts, blouses and more. The items are free and students aren't limited to one outfit. A grant from the Ohio Department of Education helped launch the career closet. Falasco said seeing students smiles uplifts everyone's spirits. Janice Weaver is the Academy Coach at North High School- a business and community liaison. "Here at North High School we are transforming traditional education to make learning more relevant for our students," Weaver said. "So by aligning our students course work with their interest areas and their passions learning becomes real in the classroom. They start to see those connections between what they're learning and what they're interested in pursuing after high school." Weaver said the career closet is making a huge impact. This week she said students are going on industry field trips and job shadows. "So they'll go to the career closet ahead of time and pick out a shirt (and) a pair of pants to complete their outfit so they feel comfortable and confident on their experience," Weaver said. "Allowing them to find a piece of clothing that makes them feel comfortable and confident during their experience on their job shadow is truly special." Students from the Step 22 program operate the career closet. They wash , sort, iron, fold and hang clothes. The program helps students with disabilities prepare for jobs and independent living. One of the students, named Chris, said he's been learning a lot. "It's fun to learn, focus... listening to our teachers and getting the job done," Chris said. "They need me here." The career closet has recently been introduced to two more Akron high schools. A closet featuring casual clothes is also up-and-running at North High School. The North Viking Career Closet is always in need of monetary donations to help cover costs of detergent, dryer sheets, hangers and other supplies. Clothing and monetary donations can be dropped off or mailed to the school. North High School is located at 985 Gorge Boulevard in Akron, Ohio. The zip code is 44310.